In 1843 the Russian Government announced that a conference was to be held at Petersburg for the purpose of deciding important religious problems. It was the intention of the government, at the instigation of the Maskilim, to use the conference as a means to introduce into the school system innovations which would interfere with traditional procedures in Jewish education and prayer. A Rabbinical Commission composed of leaders of Chassidim and Mitnagdim was convened to plan how best to combat the threat the conference posed. Rabbi Menachem Mendel was appointed to the commission. The first meeting between Rabbi Menachem Mendel and Rabbi Yitzchok of Volozhin, the leader of the Mitnagdim, made a favorable impression on both of them. Observers remarked that the meeting proved to the Mitnagdim that the Chassidim were Torah scholars, and convinced the Chassidim that the Mitnagdim were pious. This rapprochement and communal cooperation had salutary effects on the general relationship between Chassidim and Mitnagdim. The antagonists were reunited and began to work together for the common cause of traditional Judaism. At the first meeting of the government-called conference in 1843, Rabbi Menachem Mendel expressed his opinion that the purpose of the conference could only be to encourage religious observance among the Jews and he reiterated the indefensibility of tampering even with Jewish custom, since "customs are also considered Torah." Despite threats by the chairman of the conference, a Minister of Government, and being placed under house arrest on numerous occasions during the four-month period of the conference of the conference, Rabbi Menachem Mendel showed unswerving determination to oppose any proposed change of any Jewish custom whatsoever. "We are not summoned to legislate," he said. "We are here to clarify statutes previously decided in the laws of the Mosaic faith. We are here to clarify too, the customs of Israel, to protect both the commandments of G‑d and Jewish usage from tampering." The conference ended without the adoption of any of the changes proposed by the Maskilim. Rabbi Menachem Mendel's resoluteness and selflessness impressed all the participants and enhanced his already considerable reputation. The granting of "honorary citizenship" papers signed by Czar Nicholas was one of the honors bestowed on Rabbi Menachem Mendel in 1844, in recognition of his valuable work at the Petersburg conference the previous year. This great honor bestowed on Rabbi Menachem Mendel by the government made a deep impression on the Jewish population throughout the Russian Empire. Whenever an important problem arose concerning the Jewish community in White Russia, Rabbi Menachem Mendel was consulted and asked to negotiate with the government. 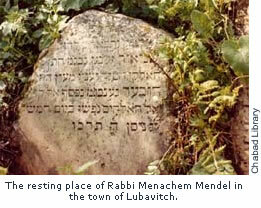 The communal activities undertaken by Rabbi Menachem Mendel thus spread into even wider fields. He made every effort to improve the economic conditions of the Jews in the "Pale of Settlement." Of all the inhabitants of Russia, only the Jews were discriminated against in the matter of where they could live. They were allowed to settle only in certain districts forming a belt or "pale." Even there, they were restricted to the urban areas and kept out of the rural areas. At the conclusion of the Rabbinical conference, Rabbi Menachem Mendel submitted a report to the Minister of the Interior on the economic situation of the Jews in the Pale of Settlement, and petitioned the Government to extend it. The reaction of the Minister of the Interior was favorable, and at the suggestion of one of his assistants, he invited Rabbi Menachem Mendel, together with two interpreters (Mr. Feitelson and Mr. Chaikin) to come and see him in the capital in order to elaborate on his proposals. The Minister received Rabbi Menachem Mendel courteously and assured him that his proposals would be submitted to the next session of the cabinet. Several days later, one of the assistants of the Minsiter of the Interior announced that, although Rabbi Schneersohn's proposals concerning the economic plight of the Jews in the Provinces of Vitebsk, Mohilev and Minsk had not been accepted in full, a decree had been promulgated forbidding the expulsion of Jews from villages and estates if they were already settled there. The precarious position of many Jews was thus legalized, and the Pale was in fact extended. News of the new regulation gained by Rabbi Menachem Mendel spread among the Jews, and hundreds of Jewish families took advantage of the new development to infiltrate into the new zone, finding ways to antedate their move so that it would meet the requirements of the law. During the summer of 1844, several hundred families settled on the land and earned a good livelihood. Furthermore, as a result of the exodus from the cities, the problems of overcrowding and competition were eased. Rabbi Menachem Mendel's personal magnetism drew tens of thousands of chassidim from all parts of Europe and Russia, and his thirty-eight years as leader of the movement were a colorful and flourishing period for Chabad. His efforts, like those of his predecessors, served as an inspiration to his successors.